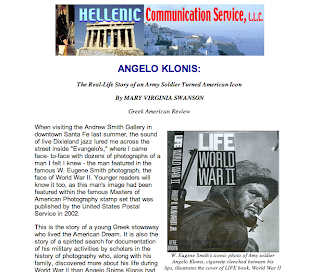 "ANGELO KLONIS: The Real-Life Story of an Army Soldier Turned American Icon" by Mary Virginia Swanson was originally published in the Greek American Review, and then reprinted online by the Hellenic Communication Service, L.L.C. in 2007. 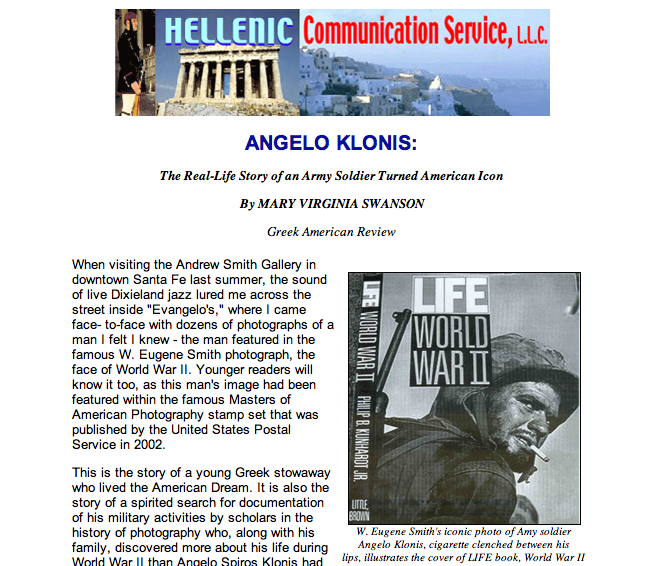 "When visiting the Andrew Smith Gallery in downtown Santa Fe last summer, the sound of live Dixieland jazz lured me across the street inside "Evangelo's," where I came face- to-face with dozens of photographs of a man I felt I knew - the man featured in the famous W. Eugene Smith photograph, the face of World War II. Younger readers will know it too, as this man's image had been featured within the famous Masters of American Photography stamp set that was published by the United States Postal Service in 2002.